The Fountain collection offers classic Louis Philippe style for your youth or spare bedroom. This beautiful Louis Philippe style daybed will be a great addition to the youth space bedroom in your home. This classic piece features shapely molding and clean lines. 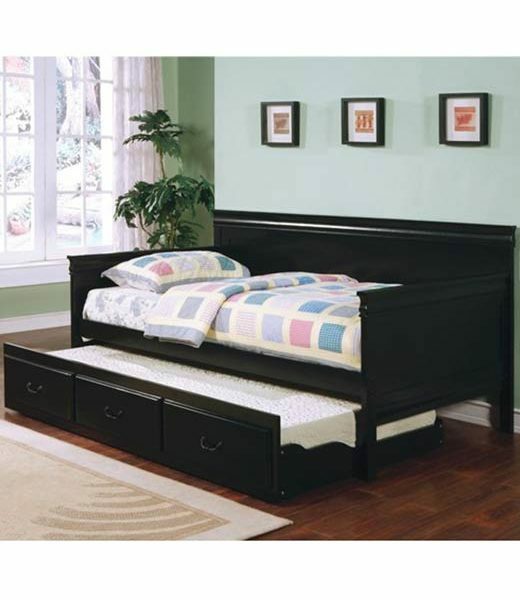 The twin daybed is multifunctional and has a pull-out trundle below to easily accommodate an overnight guest. Antique style metal bail handles accent the trundle front, and make it simple to pull out from under the bed. Available in a rich Black finish, this wonderful daybed will blend beautifully with your classic home decor to create a warm and inviting space that everyone will enjoy. The Fountain collection offers classic Louis Philippe style for your youth or spare bedroom. Shapely molding and clean lines give this group a beautiful look, available in three distinctive finishes to match your decor: Black, Cherry, and Oak. Add one of these pieces to your home for a warm transitional style that everyone can enjoy. Finish & Paint Options Available in warm Cherry, medium Oak, and deep Black finishes. Handles & Hardware Antique style bail handles on trundle unit. Case Detail Shapely molding, clean lines. 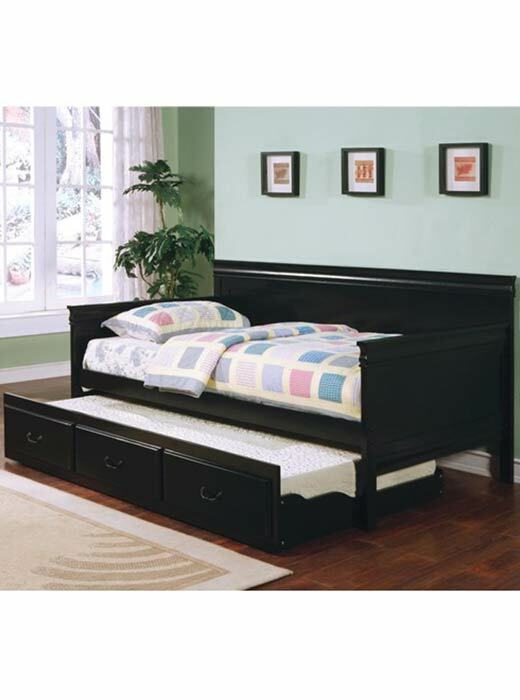 Storage This particular daybed comes included with the bottom trundle. Features wheels and has a bottom panel for the mattress. Case Construction Framed in solid wood. All Daybeds Require a Link Spring or Trundle.